Direct Shear Apparatus has been fabricated as per IS: 2720 (Part XIII). This apparatus is widely used in the construction industry to determine the direct shear strength of soil or specimen. 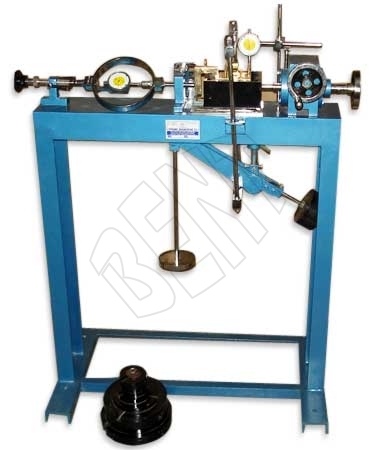 We provide the Direct Shear Apparatus in assorted specifications to meet the assorted requirements of the clients. The apparatus contains a loading unit with V-strips on which shear box housing rests supplied with load yoke with direct and lever system for applying normal load up to the capacity of 8 kg/cm2. It comprises fixtures for proving ring; brackets for holding consolidation and strain dial gauges having manually operated lead screw for shear stress application. It has complex counter balancing alignment that has been distributed and the unit is available with pre-calibrated load yoke. There is a Shear box assembly ideal for square specimen size 60 x 60 x 25mm. It is further furnished with two halves of shear box, 2 nos. plain gripper plates, 2 nos. perforated gripper plates, 2 nos. porous stones, 1 .no top loading pad and 1 no. base Plate. The shear box housing accommodates the shear box assembly. It is complete with two 1 no. ball roller strips and 1 no. specimen cutter used for cutting 60 x 60 x 25mm specimen from larger sample. 1 set of weights to give normal stress of 3 kg/cm2 through lever (without proving ring) 0.05 kg/cm2 â�� 4 nos. 1.0 kg/cm2 â�� 1 no. Proving Ring 2 kN & dial Gauge 0.01 x 25mm.